Herbal and dietary supplement-induced liver injury is more severe than other types of drug-induced liver injury (DILI), and re-exposure is more likely, researchers report in the September issue of Clinical Gastroenterology and Hepatology. Increasing awareness of the hepatoxic effects of herbal and dietary supplements could help physicians make earlier diagnoses and reduce the risk of serious liver damage. There have been increasing reports of liver injury associated with use of herbal and dietary supplements, likely due to easy access to these products and beliefs among consumers that they are safer or more effective than conventional medications. Herbal medicinal products are products in which the active ingredient is a single herbal substance or a combination of them. In many countries, herbal dietary supplements are classified differently from conventional pharmaceutical products, and so they escape regulations of efficacy and safety tests. Although there is evidence to support the health benefits of herb-containing products, some cause adverse events, including liver damage. In a population-based study in Iceland, 16% of cases of DILI were attributed to use of herbal dietary supplements. The proportion of herbal-induced liver injury cases included in drug-induced liver injury registries or in large DILI cohorts varies among countries, ranging from 1.3% to 73%. Researchers reported the incidence of drug-induced acute liver failure to be 1.61 per million person-years in adults, and herbal dietary supplements were implicated in 18% of the cases. Inmaculada Medina-Caliz et al aimed to analyze a series of herbal-induced liver injury cases in the Spanish DILI Registry and compare them with DILI cases related to conventional medication and anabolic androgenic steroids. The authors found herbal and dietary supplements to be responsible for 4% (32 cases) of the 856 DILI cases in the registry; 20 cases of DILI (2%) were caused by anabolic androgenic steroids. Herbal dietary supplements were the sixth-highest category in terms of case frequency, behind anti-infectives (37%), nervous system (14%), musculoskeletal system (11%), cardiovascular system (11%), and antineoplastic drugs (8%). 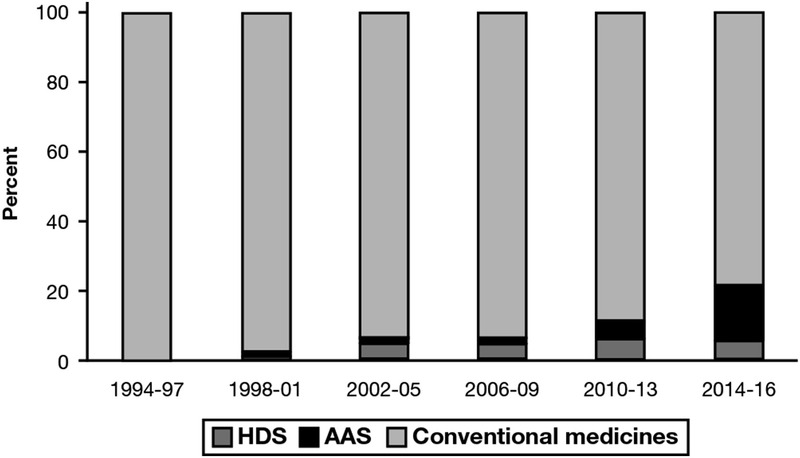 However, the number of cases of herbal supplement-induced liver injury increased steadily from 1994 through 2013 and remained constant thereafter, ranging from 2% to 6% (see figure). Most cases were caused by multi-ingredient products in 2016. Patients with herbal and dietary supplement-induced liver injury were a mean age of 48 years (younger than the average DILI case) and 63% were female (most DILI cases are men). Patients with herbal-induced liver injury had a mean level of alanine aminotransferase that was 37-fold the upper limit of normal and 78% had jaundice. The main reason people took these herbal supplements was for weight loss (15 cases, 47%). The natural supplements were used to relieve symptoms of menopause, anxiety, pain, fatigue, constipation, dyspepsia, peripheral vein insufficiency, and diabetes mellitus. For a list of the botanicals that caused the liver injury, see Table 1 in the article. Herbal and dietary supplement-induced liver injury progressed to acute liver failure in 6% of patients, compared with none of the cases of anabolic androgenic steroid-induced injury and 4% of cases of conventional drugs. Nine percent of the patients had liver injury after repeat exposure to the same product that caused a first liver injury. Repeat injuries were not found for patients with anabolic androgenic steroid-induced injury, but were observed for 6% of patients with liver injury from conventional drugs. One reason that herbal and dietary supplments might cause repeat liver injury in so many patients is that the products are generally promoted as being “natural”, and are therefore initially considered to be harmless by consumers and health care professionals. As many as 40% of patients do not disclose use of these supplements to their healthcare providers. Medina-Caliz et al state that re-exposure to these agents can be avoided with a correct assessment of what causes liver injury and providing patients with clear information about the cause. The authors conclude that their findings highlight the importance of identifying all medicinal products, prescription drugs, as well as herbal dietary supplement products, taken by patients who develop liver abnormalities. An initial suspicion of DILI, correct diagnosis, and reporting of DILI leads to not only the correct treatments and improved outcomes, but also reduces the risk of re-exposure to harmful products. How Does Inflammation Lead to Anemia?